Golf tee up Reviews and News - HONO GOLF-Bonston tee up & Travel Cover and Golf tee up Manufacturer and Supplier: shoe tee up, Golf stand tee up, golf tee up Reviews, Golf cart tee up, Golf Staff tee up, Golf carry tee up, golf travel tee up cover, golf boston tee up Reviews,golf tour tee up Reviews,golf tee up for junior,golf tee up for lady-- main products: we produce various golf Stand tee ups & cart tee ups, golf carry tee ups, golf travel tee ups, golf boston tee ups Reviews, golf indoor machine, Golf stand tee up Reviews, golf cart tee up Reviews, golf carry tee up, golf travel tee up, golf club Putter, golf club Wood, golf club Iron, Golf Swing Simulator, golf training devices, custom golf club, golf Practice net, golf indoor machine, golf club grip, tee, golf glove, golf cart, golf equipment Supplier and Maker, golf tee ups , Auto Tee-Up System, complete clubs, training aids, accessories. Golf tee up Manufacturer and Exporter- HONO GOLF - 2 in1 Golf tee up & Automatic Tee Up Machines - Related Products: golf carts , golf tee ups, golf trolley, golf staff tee up, golf stand tee up, golf cart tee up, golf carry tee up, golf trolleys, golf staff tee ups, golf stand tee ups, golf cart tee ups, golf carry tee ups, shoe tee up. 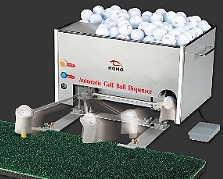 Supplier and manufacturer of golf range equipment, golf course equipment and private use.golf equipment, We produce Auto Tee-up machine/Automatic Golf Ball Dispensing machine,golf indoor machine, Automatic Tee Up Machines. Looking for agent around the world ..
All the excitement without the bad weather. 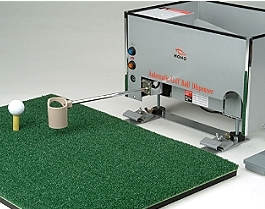 Suitable For Golf course, Driving range and Home use. 1. The screw propelling system with unique patent technology can propel the ball smoothly without any blockage. 2. The new-designed propelling system is applied to the rubber tees with various heights, which can place the ball on the rubber tee exactly and smoothly. Help you practice your impact knack (Driver, Woods and Irons) Adequately. 3. It includes AC plug and DC storage battery enclosed, which enables you to choose the place at your option. 4. 2006 new-designed types including automatic, semiautomatic and manual types based on different functions are available. 1. 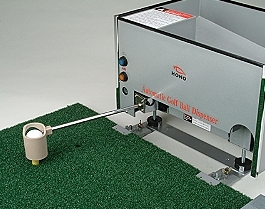 Dispensing arm sends balls from the ball exit to ball TEE, and the ball will be supplied automatically as soon as the reflective sensor detects no ball on the TEE after the ball has been stuck out. That would save time for you. Notice: Don’t pull the dispensing arm as it dispenses the ball otherwise the motor may be damaged. 2. Don’t fling the putter before the dispensing arm return to the ball exit; otherwise the arm may be hit damaged. 3. General Power: The auto tee-up machine has inbuilt AC/DC auto switching module and voltage regulator. This machine can start to work as soon as the plug is powered through. 4. Outdoor: The storage batteries can serve continuous 7~8 hours (Approximately 2,000pcs golf ball deliver) without any external power supply.